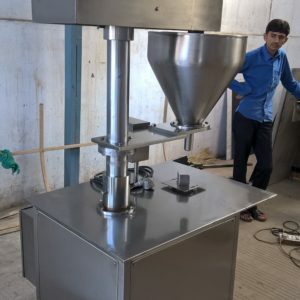 • 2 gms to 30 gms/ single doze with different powder wheel & up to 60 gms fill by double size fill depending on neck diameter and powder characteristics. 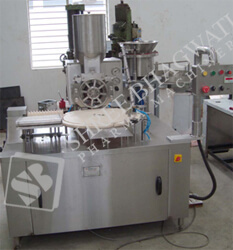 +- 2% For Depending Upon The Consistency, Uniformity & Bulk Density of Powder Under The Controlled Level of Humdity Below 30%. Conveyor transfer the bottles on to the start plate which indexes the tubes to the powder wheel where dosing of powder takes place. There is two powder Wheel given for dozing of the powder in the bottles. 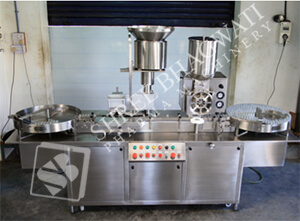 The powder is stored in a hopper which is agitated by pair of mechanical agitators for maintaining consistency and uniform bulk density. • Design confirms GMP Norms. 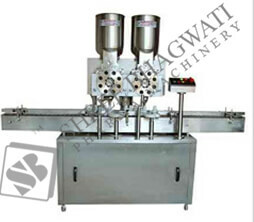 • Powder wheel piston adjustable depending to filling. • Body makes to M.S. angle structure all covering to SS 304. 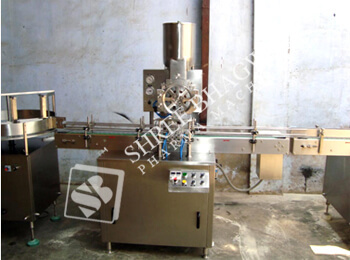 • Two bottles setting separate adjusting for cantering to powder filling station. 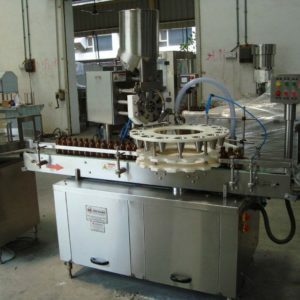 Salient Features of the Equipments. • Over Load Relay for any over load accident. • Imported Gear Box with motor. • Acrylic Cabinet with imported Aluminium Structure provided on extra cost.